Is commercializing the vegetable aisle a good way to improve children’s diets? And do we really want more marketing to children that works to override listening to their internal hunger and satiety cues? These were some of the questions that came to mind reading about companies using junk food tactics to market carrots to kids. Bettina Siegel of The Lunch Tray wrote about why the difficulties in getting meaningful curbs on the marketing of junk food has shifted her from the con to the pro side on the issue of marketing healthy food to children. Given those hard realities, and given that I will always be more of a realist than an idealist, I’m willing to let people like Dunn try to beat the junk food industry at its own game and use the same tactics to draw children to healthier food. After having worked on campaigns to market healthy food to children with Better Bites, I have shifted from the pro to the con side. That’s because raising competent eaters is not just about what they eat by why. If we’re teaching kids the what and why is because their favorite advertisement says so, we are setting them up to be vulnerable to whoever has the most clever or well-funded microphone. Parents have the right to guide their children’s food choices without so much interference from big food corporations. 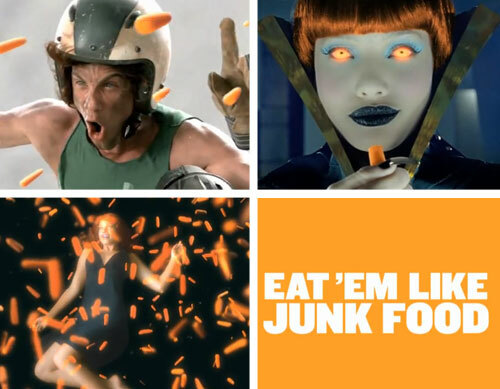 The answer to so much interference from the food industry is not to promote even more interference directed at our kids with ads (even for healthy things like carrots). The answer to so much interference from the food industry is to support parents’ rights to protect their children from it. That’s one of the reasons why I signed the letter from the Campaign for a Commercial-Free Childhood asking McDonald’s CEO Don Thompson to keep his word and stop putting Ronald McDonald into schools. Any type of marketing in schools exploits a captive audience, but it is particularly insidious to send Ronald McDonald into classrooms while schools are tasked with instilling healthier eating habits in children. I hope you’ll add your name to the list of people asking him to get this corporate mascot out of preschools and elementary schools across the United States and around the world. Tags: Campaign for Commercial Free Childhood, Michele Simon, The Lunch Tray. Bookmark the permalink.